The cost of providing free personal care has risen to more than £200m a year, according to the latest figures. Statistics released by NHS Scotland showed that the number of people receiving free personal care at home has risen by almost 70% since 2002. 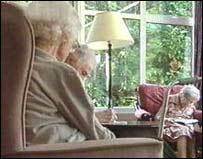 More than 40,000 people were receiving free care at home by September 2005, while 9,000 people received the benefit in a care home setting. Fifteen councils now have waiting lists for the sought-after service. The policy, which was introduced in July 2002, provides for payments of £145 a week for the personal care costs of elderly people in care homes, plus £65 for nursing care. Personal care is also free for the elderly living at home, although they can be charged for domestic services like help with shopping. The Scottish Executive is providing £147m of funding a year for free personal care, with the rest being paid for by individual councils. Deputy Health Minister Lewis Macdonald said the policy had removed financial concerns from many elderly people. He said: "Before its introduction many people had to pay for the type of care they now receive for free. "It not only helps older people but provides peace of mind to their families and support to their carers. "Costs have risen, but we have always recognised and budgeted for the rise in the elderly population. "This policy benefits thousands of older people and we remain committed to delivering free personal and nursing care for those who need it." Opposition parties have called for more Scottish Executive funding for free personal care, which they say will remove the need for waiting lists.